This study investigates what factors determine gender role in mating pairs of Helisoma trivolvis, a hermaphroditic freshwater snail. It also looks at the influence of time without access to a mating partner on gender role in Helisoma trivolvis. 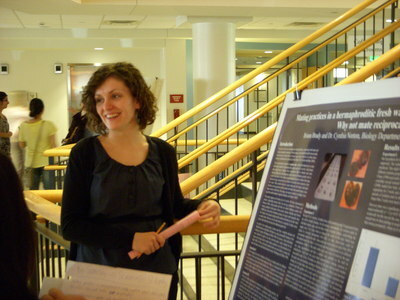 Briana Brady ’11 is no stranger to performing science experiments. With a degree in biology, Brady graduated from St. Kate’s with a wealth of research experience. This is due in part to her student-faculty research project with Professor of Biology Cindy Norton. Brady heard Norton present her own research on Helisoma trivolvis, the hermaphroditic freshwater snail, during a biology seminar. Afterwards, Brady approached Norton to ask about working together. Brady wanted to expand on Norton’s existing research around this organism, by exploring the factors that determine whether the snail takes on the role of male or female. The study includes isolating the snails from a mating partner and seeing how that impacts gender role. She also says St. Kate’s students should use their professors as resources when exploring potential areas of research. To learn more about this research, please visit Examining the Influence of Isolation on Gender in Helisoma trivolvis.